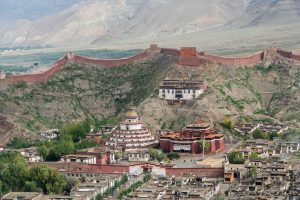 Gyantse is surrounded by hills with vast valley around it. It is nestling at the foot of this natural amphitheatre. From the hills above Gyantse you can get a view of it. You can see whitewashed houses and narrow, winding streets of the old town. Along the western side of the town there is a new road leading to the main entrance of the Pelkor Choede monastery complex. The town is dominated by a high, barren peak. Along the ridge of the peak sprout the walls of the Dzong, or fort. 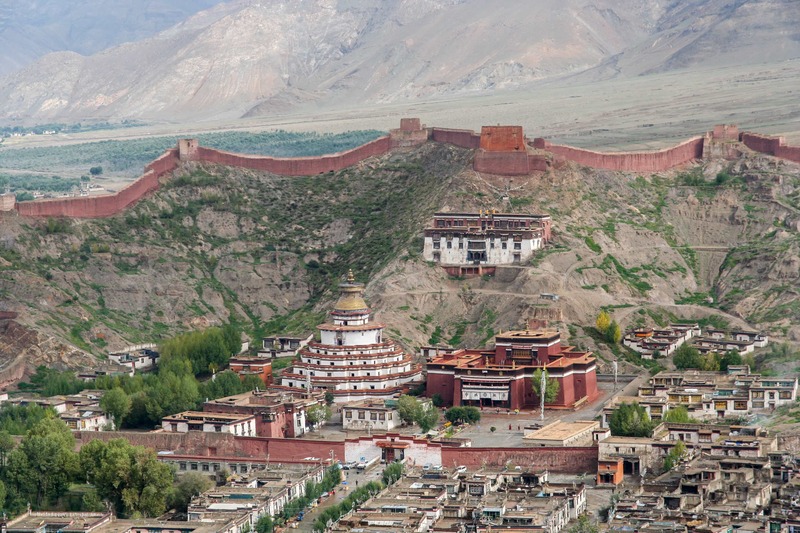 Gyantse fort was constructed in the 14th century to protect Lhasa from the South. Original wall was built earlier, and was approximately 3 km long. Gyantse first came to prominence during the fifteenth century, when it served as the capital of a small kingdom. The kingdom was established by a series of enterprising warlords from the region. Historically, Gyantse was the third largest town in Tibet, after Lhasa and Shigatse. In recent years, many Chinese moved to Tibet and new towns grew at a faster rate than Gyantse. 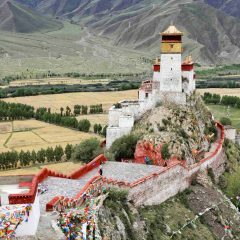 The largest stupa in Tibet – Kumbum Chorten and Pelkor Choede monastery were built around 14/15th centuries. Nine major monasteries were built in the vicinity of the town throughout the history. The exquisite Kumbum and the daunting castle still bear witness to the powers that ruled at the time. Gyantse is located on the trade routes, connecting Lhasa on the East, Shigatse on the West, and India on the South. That’s why it became the main center for Tibet’s wool trade with India, Nepal, Bhutan and Sikkim. 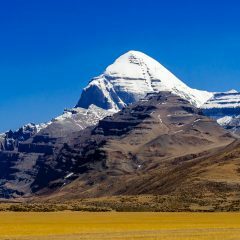 In 1904 it became the focal point of the British expedition to Tibet under Colonel Younghusband. The British soldiers approached Tibet by the trade route leading to Gyantse. The battle happened near Gyantse, in which several hundred Tibetans were shot dead by the superior British firearms. After storming the castle, Younghusband and his troops billeted here for a month before proceeding to Lhasa. Finally, British and Tibetans reached an agreement. According to this agreement, British trade agent was stationed at Gyantse. The British also opened a small school there. 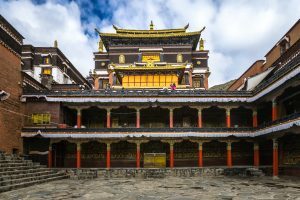 Pelkor Choede monastery was founded in 1418 by the first Penchen Lama. 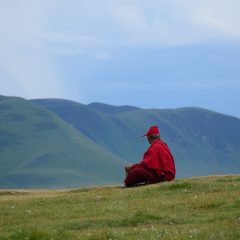 The red-walled Pelkor Chode was once a compound of 15 monasteries that brought together three different orders of Tibetan Buddhism, a rare in stance of multi-denominational tolerance. Nine of the monasteries belonged to Gelugpa sect, three belonged to Sakyapa, and another three belonged to the obscure Buton suborder whose head monastery was Shalu near Shigatse. 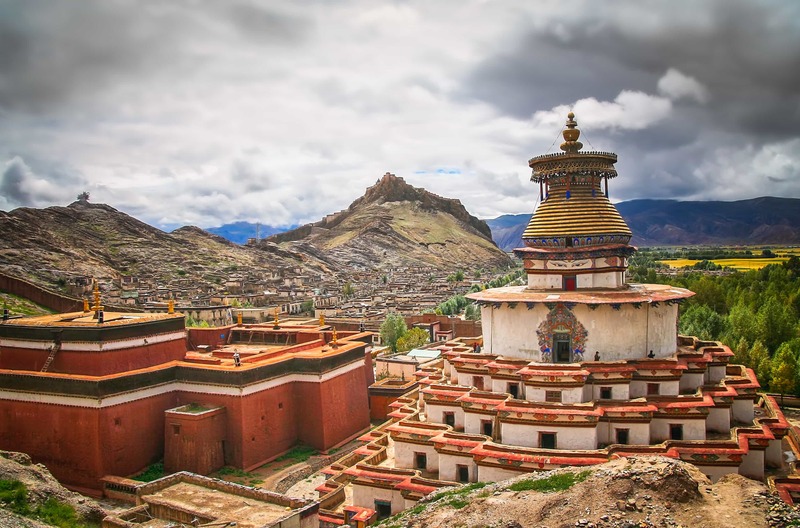 The monastery is famous for it’s Kumbum stupa, the largest chorten in Tibet and one of the architectural wonders. The white chorten contains a seemingly endless series of mural-filled chapels and offers an outstanding view from its upper levels. Gyantse Kumbum Chorten was commissioned by a Gyantse prince in 1427, the Gyantse Kumbum is the town’s main attraction. The 35 meters high chorten, with its white layers trimmed with decorative stripes and its crown-like golden dome, is awe-inspiring. The interior is equally impressive. Kumbum means 100,000 images in Tibetan. Indeed, there is what seems to be an endless series of tiny chapels. Each chapel is decorated with wall paintings, some have various statues of Buddhas, Bodhisattvas and deities. Most paintings date to the time of the construction of the stupa. There are nine levels, 108 cells and 75 chapels. At the higher levels you can go out to an outdoor terrace and enjoy an incredible view on the town, monastery and surrounding fort. Shigatse, the capital of the province of Tsang, is 354 km west of Lhasa. 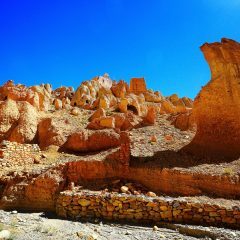 It is located 90 km west of Gyantse on the south bank of the Brahmaputra at the point where the Nyang Chu River flows into it. 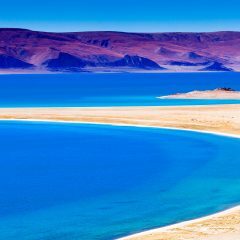 It can be reached by two routes from the capital by the Northern Road, which runs from Golmud and reaches Shigatse via the Daktsuga ferry over the Brahmaputra, of the Southern Road via the town. Shigatse has long been the commercial and political centre of Tsang region. Formerly it was dominated by a massive castle built on the hillock above the old town. Only the basses of the ramparts are visible today, suggesting non etheless the grandeur of the building. This is where the powerful kings of Tsang lived, during their rule in the late sixteenth and early seventeenth centuries. Since the time of the Fifth Dalai Lama, the town has been the seat of the Panchen Lama. 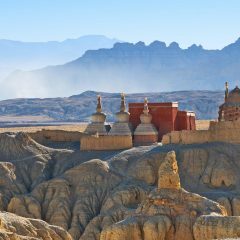 His monastery, Tashi Lunpo, is the only place of genuine interest left. Recently the Panchen Lama built a new palace, the Dechen Potrang but this is a building with little attraction. 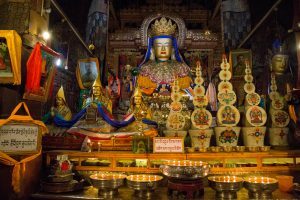 Tashi Lhunpo Monastery is one of the six great Gelugpa institutions, along with Drepung, Sera and Ganden Monasteries in Lhasa, and Kumbum (Taer Si) and Labrang in Amdo (modern Gansu and Qinghai provinces). 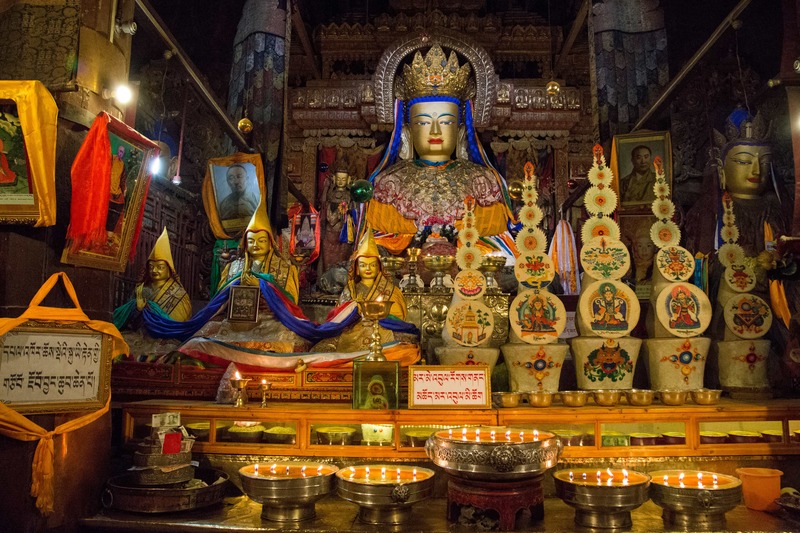 It was founded in 1447 by Gendun Drup, the disciple of Tsongkhapa. Gendun Drup was retroactively named the first Dalai Lama and he is enshrined within Tashi Lhunpo. 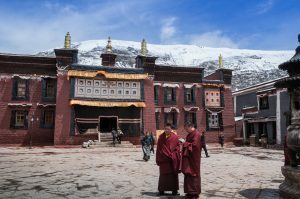 Despite its association with the first Dalai Lama, Tashi Lhunpo Monastery was initially isolated from mainstream Gelugpa affairs, which were centred in the Lhasa region. 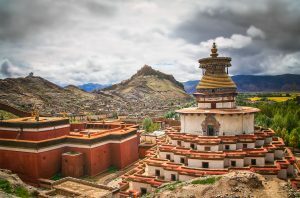 The monastery’s standing rocketed, however, when the fifth Dalai Lama declared his teacher then the abbot of Tashilhunpo to be a manifestation of Opagme ( Amitabha ). This Tashi Lhunpo became the seat of an important lineage: the Panchen ( “great scholar”) Lamas. Unfortunately, with the establishment of this lineage of spiritual and temporal leaders second only to the Dalai Lamas, rivalry was introduced to the Gelugpa order. 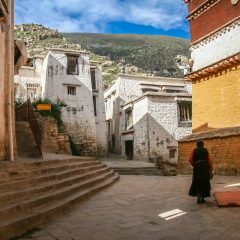 The monastery has a very high profile as the largest functioning monastic institution in Tibet. The monks, however, can be somewhat cool. If you are seeking spiritual enlightenment, Tashi Lhunpo might not be the best place to begin your quest. 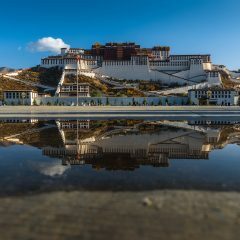 The monastery was established in 1268 and is designed defensively, with watch towers on each of the corners of its high walls and it is one of Tibet most impressive construction sights. Before the Cultural Revolution, Sakya Monastery had one of the largest monastic communities in Tibet. As usual, morning is the best time to visit as more chapels are open. Directly ahead from the east-wall main entrance is the entry to the inner court yard. The dusty, somewhat pedestrian looking courtyard is a bit of a disappointment after the grandeur of the outside walls but things pick up again as you enter the main assembly hall (Lhakhang Chenmo) a huge structure with walls 16m high and 3.5m thick. Sakya actually has two monasteries, on either side of the Trum-chu. The heavy, brooding, fortress-like monastery south of the river is the more famous and if you only have time to visit one, make it this. 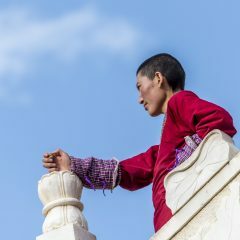 The hill- side northern monastery, mostly reduced to picturesque ruins, is undergoing restoration work. One characteristic feature of the Sakya region is the colouring of its buildings. 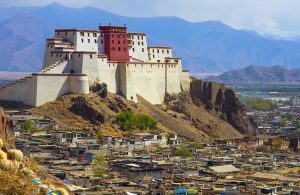 Unlike the standard whitewashing that you see elsewhere in Tibet, Sakya’s buildings are ash grey with white and red vertical stripes. The colouring symbolises the Rig Sum Gompo (the trinity of bodhisattvas) and stands as a mark of Sakya authority. 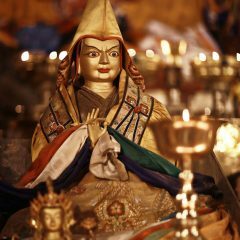 Sakya literally means ‘pale earth’.